Analysis: Halloween is a great time watch a scary movie, but why do we like being scared and what makes a great horror film? We are essentially seeking cheap thrills when we watch horror movies. Like riding roller-coasters, scary films allow us to experience heightened sensations, but in relative safety. Brain-mapping experiments have helped reveal that neural networks controlling fear and anxiety are activated in subjects watching horror films. The subsequent release of stress hormones like dopamine, adrenaline and cortisol in our bodies is an experience many of us evidently enjoy. Clearly, horror movies aim to stimulate this fight-or-flight biological reaction to perceived danger, but how do they achieve this? It is no surprise that the horror genre is filled with creatures hell-bent on devouring people. Humans may be the predominant species on the planet, but it is not that long in evolutionary terms since we lived in much greater danger of predation from larger, fiercer creatures. A fear of being eaten, or bitten, by animals is effectively hard-wired into our psyche. Eye-tracking studies have shown that even children are quicker to spot pictures of threatening animals, compared to harmless objects, demonstrating humans have an in-built awareness of danger in nature. Documentary On One Hallowe'en special with extracts and short docs from the archive to mark the spookiest night of the year. Thus, monster movies effectively trigger those survival instincts which we have developed as a species. That involuntary yelp we emit during scary moments is basically a warning signal to others about nearby danger. Likewise, fear of infection, followed by sickness or death, is another deep-rooted human dread which we have inherited from our ancestors who didn’t have medicine to save them. Notably, all of our favourite movie monsters, like werewolves, vampires and zombies bite their victims. Our collective human experience through history means we are instinctively repulsed by such actions onscreen. Bloodshed is a staple component of horror films and our visceral response to gory scenes is again linked to our evolutionary biology. We have evolved to recognise the sight of blood as potentially life-threatening, so our natural response is one of alarm, even when viewed in a fictional context. Intriguingly, one Dutch study showed levels of coagulation factor VIII were increased in subjects watching a scary film, demonstrating how the body prepares for potential blood loss in response to danger. It appears that films can actually be blood-curdling! However, what we don’t see can sometimes be equally frightening. Masked killers are a regular fixture in horror cinema and we find them scary because our innate facial recognition capabilities are hindered. From an early age, humans learn to read visual cues in faces to help develop communication and social relationships. However, horror films featuring masks (not to mention dolls, puppets and face-painted clowns) prove unnerving because our brains don’t like it when there is an absence of clear facial expressions to help perceive intentions. Sound in films is much smarter than the simple use of a loud musical sting to accompany the jump scare. A 2010 study showed that the human brain is naturally averse to amplified "non-linear" sounds, like those made by distressed animals. The study showed that music in horror films which approximates these non-linear sounds is particularly unsettling for viewers. 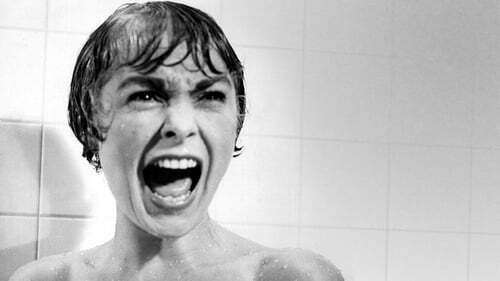 The screeching violins which accompany the shower scene in Psycho is the classic example, but movies as diverse as Jaws, Suspiria and The Shining have all used similarly discordant scores to nerve-shredding effect. In addition, animal noises and screams will often be incorporated into the sound design to disturb audiences. But what we cannot hear can also be effective. Studies have shown that very low-frequency sound, at the limit of human hearing, can induce nausea and unease in people, due to the pressure of the soundwaves on the eyeball and inner ear. This helps explain how David Lynch, who has long experimented with ambient sound in his films, can build apprehension in viewers. Similar use of low-frequency sound in the films Irreversible and Paranormal Activity affected some people so badly, they couldn’t continue watching. Rather alarmingly, some researchers even suggest a hypothetical frequency called the brown note exists, which causes listeners to relax their bowels involuntarily. The marketing slogan for the first film to use that tactic is not hard to guess! Ultimately, the impact of a horror film will depend on how "real" it feels to the viewer. We can all remember movies that scared us as children before were fully able to distinguish between fiction and reality. However, even as adults, our individual beliefs, personal experiences and immediate surroundings will influence our immersion in a film. The best horror movies create empathy with characters in relatable situations, even within a fantastical narrative. For example, fear of the dark is a common phobia, so many horror scenes are set in the night in the dark. Similarly, widespread belief in the afterlife explains the enduring appeal of ghost stories, while zombie movies are widely held to variously reflect societal anxieties about viral disease, war, racism and rampant globalisation. The more we believe in what we watch, the more our unconscious, instinctive reactions will override our conscious, rational mind, intensifying those delicious thrills we are seeking.